When it comes to using a table saw safely, one thing that should be on your list definitely should be a push stick. Do not limit yourself to one model but rather to different shapes for various applications. The push stick can be built from scrap wood such as pieces of plywood. It may prove useful some day in saving a finger or two (or worse)! The push stick is very handy for ripping thin material on a table saw. How thin should the material be? Some manufacturers recommend that if ripping material on a table saw that measures 5" or less you should use a push stick. Generally that's the minimum rule, but one should keep in mind to compensate for the width of the hand. 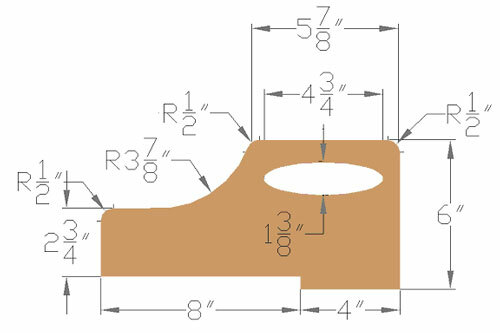 Below is a diagram of one type of push stick. Feel free to adjust the dimensions that suit your needs best. Remember, the push stick alone is not the safest tool but in combination with a feather board and clamps, it helps improve safety. Always be alert and work when your are fully rested when using a table saw and other cutting tools. Better be safe than sorry!